Dr.Malpani's Blog: Early pregnancy scans- is my baby fine ? Pregnancy can be a very exciting time, but it can also be every nerve racking, especially when you go for your ultrasound scans, because you’re never sure what the results are going to be and what they mean. Is my baby fine ? How many babies are there ? Is the baby in the right place ? Is my baby growing well ? Is the heart beat okay ? Is the pregnancy progressing well ? You have many questions and your mind plays all kinds of games with you, especially when you have symptoms – and even when you don’t ! For example, if you don’t have any morning sickness , you start wondering - Is my baby alright ? Or is something amiss ? This becomes worse when you compare yourself with other pregnant women , and find out that what’s happening to you is perhaps not typical of the others. Since about 10% of all pregnancies fail, your doctor does serial ultra sound scans for you , to reassure you that all is well. This is especially true if you have conceived after IVF. However, interpreting ultrasound scans during early pregnancy can be quite tricky . The pregnancy grows and develops quickly, which means scan findings evolve dramatically over a few days . What’s normal at 6 weeks is no longer normal at 8 weeks ! It’s usually a technician or a sonographer who does the scan, and they will often not interpret what the scan means, or even share information as to what the scan shows. Their standard reply is - I will do the scan for you , but you will have to discuss the results of the scan and what it means with your doctor, because I am not allowed to tell you. This creates even more suspense. For example, when you can see a sac on the scan, but you can’t see a baby , what does this mean ? Does this mean that the baby is dead ? or that the baby is fine but because the scan has been done too early the baby is too small to be seen on the scan ? The problem is even worse when the doctor can see the baby, but can’t see the heartbeat. Does this means that the baby is dead ? or it not growing properly ? Or does it mean that the ultra sonographer can’t see the heart beat because his machine is not good enough or he is not skilled ? Maybe the heart beat will appear on the next scan , and it’s too early for your baby to have a heart beat as yet. Are you six weeks ? or are you eight weeks ? and how do you calculate the date ? Do you use menstrual age ? or do you calculate the baby's age based on the date of embryo transfer ? 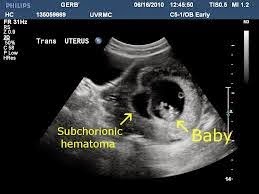 You will google extensively to find out what other women’s pregnancy scans look like , and this can scare you even more, because there is so much biological variability during pregnancy. Thus, some babies will have a heart beat at 6 weeks, while for others it may not be seen until they are 7 weeks pregnant. You are frantic with worry until you actually get a chance to meet your doctor , but sometimes all the doctor can say is - We need to repeat the scan again next week to make sure all is well. If you would like to cut down the suspense , we can help you make sense of your pregnancy scan results ! Please visit www.hcgexpert.in and enter your scan findings, and we’ll be able to tell you if your pregnancy is progressing normally or not. This is a free service, and we hope it will help to reassure lots of women that their pregnancy is fine, so that they can enjoy it properly, rather than worry needlessly !